Traveling in India by train - The best luxury trains in India. There’s something so undeniably romantic about train travel, isn’t there? Watching the scenery go by as you chug along across a county is old school in the best sort of way. The magic of train journeys seems to have faded somewhat, though, with the advent of speedier ways to get to your end destination. But that doesn’t mean that you have no options – in fact, luxury travel is making a bit of a resurgence in India, and we’ve got quite a few options for bespoke luxury experiences to choose from. At India Someday, we’re big fans of train travel, and, we’ve put together a list of some of the most luxurious train experiences the country has to offer! 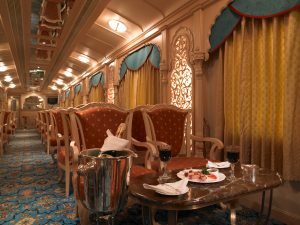 The Palace on Wheels is truly the grand dame of truly luxe Indian trains, the one that blazed the path that the rest have followed. This train was once a literal palace on wheels – it was used by nizams and kings to get around their territories. It’s now been given a revamp, but retains all of its heritage and regal nature. The Palace on Wheels takes you across Rajasthan over the course of eight days. You’ll get to see all the top sights of the state, and spend the rest of your time being spoilt silly by all the amenities on board. The cabins are luxurious, the staff are gracious to a fault and will help you with whatever you need, and there’s a fully stocked bar – it’s a great chance to live like a king for a while! If you’ve ever wanted to take your five-star hotel room with you out on the road, well, look no further! The Deccan Odyssey is by managed by the Taj group, one of the pioneers of luxury hotels in India, and promises that five-star experience as you travel across the county. There are six route options to choose from that cover the Deccan region (of course), Gujarat, parts of Rajasthan and Maharashtra. And it goes without saying that the train itself is outstanding, from the décor, which is opulent and thoughtful, to the staff, which is always happy to help. The train has lounges, multi-cuisine restaurants, a conference centre and even a spa – need we say more? Further south, there’s the Golden Chariot to consider. The Golden Chariot is an undertaking of the Karnataka State Tourism Board. It takes you to some of the countries top World Heritage Sites and past some of the most stunning scenery on the way. The furnishings are distinctly South Indian in flavour, harking back to the kingdoms that used to rule these lands. There’s a spa on board as well, so you don’t miss out on those Ayurvedic massages while you’re travelling. These are just some of the options out there – let us know if you’re looking for something in particular, and we’ll help you make it happen! The cost of luxury trains in India is comparable – or even favourable to similar experiences in different parts of the world. While the final figure might look a bit daunting, consider what you get in exchange – a taste of royal life, as only India knows how to provide, as well as the ability to take in the diverse landscapes and many sights, sounds and flavours that make this country so unique and special to travel in. 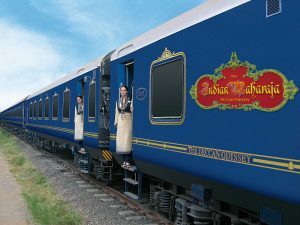 If you need any help booking luxury trains in India, get in touch with us!